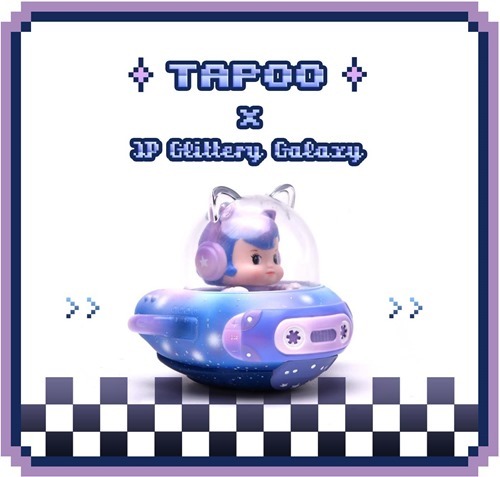 JP Toys is starting off 2019 in style with its Exclusive JP Glittery Galaxy Tapoo from Ciecy. The cosmic new edition of the red hot Tapoo soft vinyl features soft, spacey blues, pinks and purples. JP Glittery Galaxy Tapoo will be sold for 2400 baht (~$73)via a short 1 hour online lottery starting at 8:30 PM PST on Friday (1.4). To enter fill out the special order form on the JP Toys Facebook which would be available around drop time. If you’re not familiar with the spacey retro cuteness that is Tapoo, Ciecy introduced this friendly UFO in 2018. Collectors have quickly caught on and have proceeded to sell out recent releases including at DesignerCon and Toy Soul (both the regular and mini Xmas editions).